Unpaid testimonial coming at you. That's right, spreading the love about a product that works out of the sheer goodness of my heart, cuz I'm nice like that! 1. Put a few towels down on a table to catch drips from freshly washed records. 2. Fill the spin clean to the fill line with DISTILLED water. Tap water will leave spots and hard water residue so cough up a buck for a gallon of distilled water. 3. Put in the brushes. 4. Put in the rollers that the records rotate on in the right spot for 12", 10" or 45rpm records. 5. Pour 3 cap fulls of the cleaner right on the brushes. 6. Insert the record, The rollers will prevent the label from submerging. 7. Spin clockwise and counter clockwise 3 full rotations in each direction. 8. 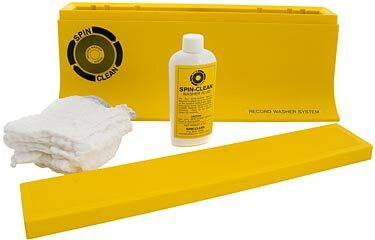 Remove record and dry the vinyl with the supplied lint-free, scratch-free towels. According to the specs, one tub full of water and 3 caps of their solution does 40 records before needing a fresh batch of cleaner and water. So I did 40 classical records that were not too dirty, or so I thought. I looked in the bottom of the spin clean after I did those 40 records and there was a pile of dirt that was obviously from those 40 records. The solution breaks down the oil and residue and turns it to deposits of dirt so what doesn't look dirty, it becomes obvious that it is quite dirty. So after I did those 40, I REALLY put it to the test. I busted out my dirtiest records, my scratch tools records. My Dirtstyle 10 year anniversary records record, which I use every time I get my scratch on, had so much grunge on it from years of pawing at it. After the 6 rotations in spin clean and drying it off with the towels, every last paw print was gone. The thing looked MINT! I couldn't believe this was the record I learned how to cut on because it was shiny and brand new looking. I did a few more dirty records stopping at 50 and the water was almost brown from the filth. The 50th record was still shiny when I stopped, so I'd say, hell yeah this thing works! I give it my 2 thumbs up approval, and at 80 bucks I'd say it WELL worth it in comparison to the much more expensive automatic cleaning tools which cost hundreds of dollars. It's a bit cumbersome, and you need a lot of space to work, and it took about 4 hours to do 50 records so this in not your casual cleaning system. It's good for batches of records that need serious TLC. If you need light cleaning of dust and minor finger prints use GRUV GLIDE and for medium cleaning I'd recommend GROOVY CLEANER and for deep cleaning I'd recommend SPIN CLEAN for sure. HAHA. That record you can scrub with pumice soap underwater with no guilt. ^^ don't be hatin on Herb Alpert !!! I have a ton of his records . I picked up like 10 of them at the Kiwanis Thrift store in Florida for like a buck fifty ($1.50 not $150 ) . I'm gonna have to cop a spin clean. I was always curious about how they work . Did you lose a lot of the surface noise / pops after cleaning ?? Always wanted to know if that happens after a real cleaning . My records always use THIS and THIS. They work great . Also use GruvGlide if I have it . Although Phoenix works great , some of my records could use a real deep cleaning . Edited 1 time(s). Last edit at 08/12/2013 07:35PM by jaybrown. I'm not hating on Herb, just saying that's a cheap easy find as you found out. Never hate on the Herb! and yeah, it killed surface noise like you wouldn't believe.